If you are pregnant and like your naps then you should check out this sleeping for two maternity t-shirt. The shirt has long sleeves and comes in many colors and is available in women’s sizes Small – 2XL. 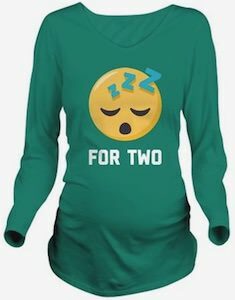 On the maternity shirt you can see a sleeping emoji and below it the text “For Two” making this a fun sleeping for two t-shirt. Now you can have the perfect shirt for your belly and telling people around you that you need a nap soon as you need to rest for two. 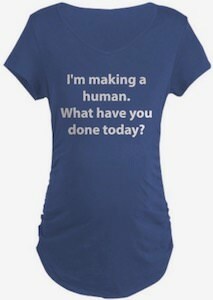 If you are looking for a funny maternity t-shirt then this could be the one. You can get this maternity shirt in many colors and sizes and it is also available in long sleeve and a tank top. On the shirt, is says “I’m Making A Human. What Have You Done Today?” which is funny and makes people wonder how productive they were while you were making that human being ready for its appearance. So no need to wear boring shirts that fit your baby bump because this top is fun and will fit just the way you want it. We all know those Keep Calm products and now there is one perfect for pregnant women. This blue maternity t-shirt shows a baby bottle with below it the text “Keep Calm I’m Pregnant And It’s A Boy”. Wearing this t-shirt of course should not surprise the daddy because he should know by now but it would be perfect for a surprise of friends or to wear to the baby shower where then everyone can know that it will be a boy. This t-shirt is made from 100% preshrunk cotton and is available in many maternity sizes. Now is a good time to dress up in this Keep Calm I’m Pregnant And It’s A Boy Maternity T-Shirt. All mother’s to be have a certain glow to them no matter what time of year, but this t-shirt will add a glow to the holiday season. This long sleeved, v-neck t-shirt comes in sizes Small to 2XL to fit every expecting mother. It comes in four great colors and is made of 100% cotton. To top it off, the t-shirt has side ruching to accent the mother to be’s curves. Are you looking for the perfect t-shirt that will easily tell everybody that your pregnant. Here is a cute and funny t-shirt that features the bum of a little baby on the front, just low enough it looks like it is exactly where you would be carrying your real baby. Also this t-shirt makes the little baby buns look like they are in an oven and the saying at the bottom is “Buns In The Oven”. Made from 100% cotton this super soft and comfotable “Buns In The Oven” t-shirt is a great maternity go to shirt, it may break the ice where ever you go. Get your Maternity Buns In The Oven T-Shirt. Mom’s to be, check out this fun and cute t-shirt. This is a t-shirt that every mom definetly needs to get, with little feet and hands on the stomach area it will let everyone know you are pregnant and draw some fun attention at the same time. This baby feet and hands t-shirt is a babydoll style and is made from 100% pre-shrunk cotton and is very durable, you can find this shirt in sizes Small to 2XL and in colors Black, Red, Caribbean Blue and violet. Have a look at your Baby Feet And Hands T-Shirt. The Big Bang Theory watchers know what this is all about. And if you need this maternity shirt and you know what Sheldon Cooper is thinking right now. But still it seems like a fact that the pregnant lady who wear this shirt love Coitus. 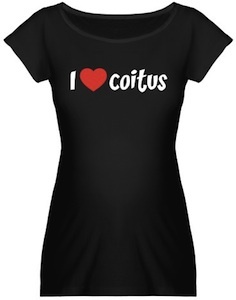 Go order this I Love Coitus Maternity T-Shirt for all the pregnant women out there.